This was the view from our landing window last week after the arrival of the Beast from the East. The snow has all gone now, thank goodness. Although it was so beautiful – what fabulous icicles – it was also very inconvenient. I didn’t get my car out for a week and like many other people I had to cancel a lot of plans. I know, I know, if I lived in Canada or Russia or Finland, I’d think nothing of it. But I don’t live in any of those places and several winters can go by without this kind of snowfall and bitter cold. One or two friends pointed out that things could have been worst and that at least I wasn’t stranded in Antarctica like the main character in Cold, Cold Heart. Which leads me on to a bit of PR and a couple of bargains. The e-book of Cold, Cold Heart has been reduced for a limited period to £4.19. https://www.amazon.co.uk/Cold-Heart-Snowbound-stone-cold-killer/…/1782642161. For the first time ever in the fourteen years we are completely snowed in. Yesterday we woke to 16 inches of snow and it has gone on falling ever since off and on. In the past there has always the train to fall back on (that was how we got to our son’s wedding four years ago, when snow and a fallen tree blocked the way out of the village). But yesterday the trains stopped running. The school’s closed today for the third day running, but even if wasn’t, we couldn’t get there. There isn’t a village shop (it closed in the summer). Walking to the next, larger village is a last resort as the snow is over our wellies and anyway deliveries haven’t been getting through there either. The milkman and postman are not getting through and the organic fruit and veg delivery people have rung to say they can’t make it tomorrow. However we are in no danger for running out of food for a while. True, we have no milk now, or eggs or cheese (except for Parmesan) and not much fruit and veg. However we have loads and loads of rice, pasta, olive oil, coffee and tea, because I buy them in bulk. Quite a lot of Parmesan, lentils, tins of red kidney beans and other pulses and enough flour for several loaves. Also a tin of sardines and one of corned beef. A joint of pork in the freezer. No cake, biscuits or chocolate. Yesterday we got a craving for something sweet so we broken into the Xmas cake that we made a fortnight ago. Might have been better if left to mature, but it’s very good all the same and there’s always too much at Xmas anyway. We’ve got plenty of wine and there is wood in the woodshed. Thanks to my book-buying habit there is no shortage of things to read either. To be honest I probably have enough books to last for the rest of my life, what with ones I haven’t read and ones I’d be happy to re-read. It’s comfort reading at the moment. I am well into THE NINE TAILORS and am thoroughly enjoying it. And I’ve found a recipe in Peg Bracken’s THE I HATE TO COOK BOOK for a chocolate cake that uses cocoa and cooking oil instead of butter or margarine. So I might get my chocolate fix after all. I don’t usually blog about the weather, but it is the dominating fact of our lives at the moment. The snow arrived last Friday night and the threat of more stopped us going away at the week-end. It wasn’t too bad yesterday: my husband got his car out and our daughter got to school. But this morning we woke up and realised that we weren’t going anywhere. Six inches of snow had fallen on top of what was already there. The school was closed. My husband decided he had better work at home. Before it happened I was groaning in anticipation of the sheer inconvenience and extra effort that would be involved, and yet I have to admit that there are compensations. 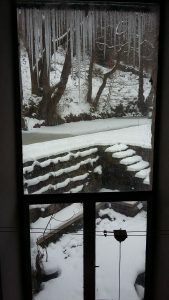 As I look out of the window this afternoon it is snowing again and it is intensely beautiful. All I can see are trees and snow and the neighbour’s woodshed. The brillance of the light is invigorating. It could be Sweden or Finland. A while ago my daughter and I walked up our lane to the main road. Normally there are cars whizzing up and down. Today virtually all we saw was a gritter and snow plough. We walked up the middle of the road and drank in the silence. Life is simplified. I can’t get to the shops unless I walk to the station and catch a train into Sheffield. So we’ll make to do with what we’ve got and that’s fine. The inconvenience really starts when the thaw begins and we have to go out to struggle along on icy pavements and roads. For now though ordinary life is suspended and there is pleasure to be had in drawing the curtains and throwing another log on the fire. And what is the ideal book for the snowbound reader to read in front of that fire? The book I have taken off the shelf is the Dorothy L. Sawyers classic, THE NINE TAILORS, which opens with Lord Peter Wimsey running his car into a snow drift. Time to re-read that, I think. Before I finish, I said in a recent blog that I’d be reading some more William Maxwell and I have. SO LONG, SEE YOU TOMORROW is even better than TIME WILL DARKEN IT. Just wonderful. After I wrote about SICK HEART RIVER in last week’s blog, I got to thinking about other works of fiction that deal with the intense cold, not least because we’ve had a bit of that ourselves and have been snowed in. I realised that some of the most memorable books I’ve read have dealt with weather conditions of snow and intense cold. I first read Apsley Cherry-Gerrard’s THE WORST JOURNEY IN THE WORLD (1922) about twenty-five years ago when a friend and I were house-sitting in Sussex. It was written by the youngest member of Scott’s disastrous expedition to the South Pole. Cherry-Gerrard was part of the rescue team that found the frozen bodies of Scott and three other men. I recommend this book as a cure for mild depression, because as you read it you begin to feel profoundly grateful that you are not there. At least, you console yourself, you haven’t been driven to eating the ponies. So things can’t really be that bad. Solzhenitsyn’s A DAY IN THE LIFE OF IVAN DENISOVICH I always associate with the winter I spend as a postgraduate at Keele University. Hardly the gulag, I agree, but it was very, very cold and there was still snow on the ground at Easter. Transport connections were lousy and I had a bad case of cabin fever. Peter Hoeg’s best-seller, MISS SMILLA’S FEELING FOR SNOW, was gripping for about the first two thirds, but the plot became preposterous after that and it is largely the evocation of a wintry Copenhagen that stays in my mind. Finally, Jack London’s short story ‘To Build a Fire’ (1908). I first read this years and years ago – probably as an undergraduate – and I have just found the full next on the internet. It is about a man travelling in the Yukon whose only hope of survival is to build a fire and it is just as chilling in every sense as I remembered. I don’t want to spoil it for you. Go and read it – and shiver.